Unfortunately, I didn't experience the TWA stage because I transitioned to natural hair without cutting my length off, but if I could do it all over again, I think I would spend some time loving and nurturing a Teeny Weeny Afro! This can mean everyday or every other day depending on how you style your hair. Use water, water based products and aloe vera juice to add moisture to your hair. While your hair is really short, there’s nothing wrong with getting it wet in the shower every morning if you want to! Scalp health is always important but when you have a TWA, making sure your scalp is super healthy is extremely important because you have less hair to protect it. Keep your scalp clean, clarify if you have to and massage your head with your favorite oil often to keep your blood flowing. Don’t think that just because your hair is short you can avoid protecting it as much as you should! Sleeping with a satin scarf is always recommended but you can also opt for a satin pillow case as an alternative. Either way, protecting your hair from the beginning will only be beneficial as your hair grows longer-- the hair on your head now will become the ends of your length! Do accessorize, do wear parts, do play with products and do play with color (responsibly). 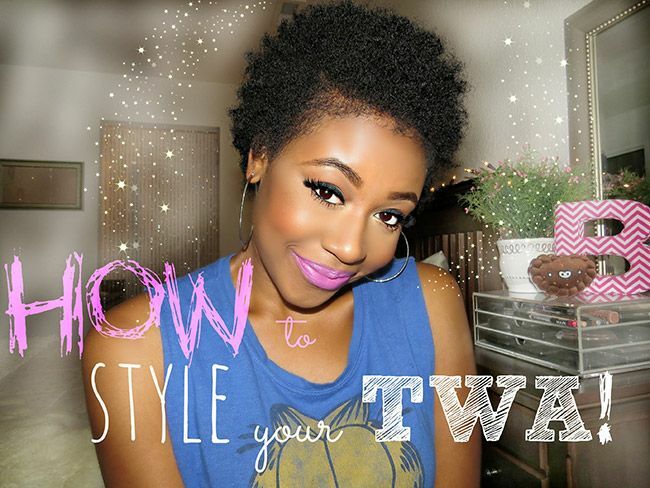 Have as much fun as you can with your TWA because that phase ends pretty fast! Below are video demonstrations of 3 easy ways to style your TWA. What styles did you rock when you were in the TWA stage?